SCITEC NUTRITION - MEGA KRE-ALKALYN - la creatina a "Ph corretto". La soluzione per chi ha problemi con la tradizionale creatina monoidrata. SCITEC NUTRITION - MEGA KRE-ALKALYN - la creatina a "Ph corretto". La soluzione per chi ha problemi con la tradizionale creatina monoidrata. - Minore ritenzione idrica sottocutanea. - Minore gonfiore di stomaco (bloating). - Dosaggi + bassi - problemi. Si consiglia l'assunzione di 1-2 capsule al giorno con abbondante acqua. Kre-Alkalyn (creatina monoidrato a ph corretto), gelatina alimentare, cellulosa microcristallina. Creatine Monohydrate has been proven through decades of research to enhance strength, endurance, and athletic performance. However some athletes have noted side effects including nausea, stomach cramps, bloating, and a host of other unwanted reactions. What wasn't realized until recently is that these side effects are actually caused by creatinine, and not Creatine. Kre-Alkalyn® is Creatine which is 100% stable and will not break down into Creatinine. 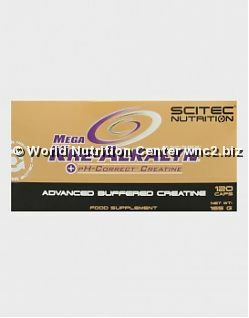 This allows the Creatine to be absorbed more efficiently into the bloodstream. Kre-Alkalyn® allows athletes to use smaller serving sizes while experiencing even more explosive results. On June 4, 2002 Kre-Alkalyn® was awarded official U.S. Patent #6,399,661. The patent discusses an oral Creatine supplement and the method of manufacturing this supplement, which includes mixing an alkaline powder with a powdered Creatine until the pH of the mixture is in the range between 7-14. The research behind Kre-Alkalyn®'s patent shows that Creatine's speed of conversion to creatinine is directly related to the pH of the liquid used for mixing-the lower the pH, the faster it converts. Conversion of Creatine into the waste product creatinine can be halted by pH level alteration during the manufacturing process. Kre-Alkalyn® has a pH above 12 because its molecules are synthesized with "buffering" agents using a patented manufacturing process. As a result, it remains completely stable and reaches muscle cells at full strength. This helps the body absorb more Creatine, thus lowering the serving size required for beneficial results. Preliminary feedback for Kre-Alkalyn® has been positive. Many athletes report a decrease in water retention and the elimination of bloating. Many athletes also report immediate results even with the elimination of the "loading" phase normally followed for regular Creatine Monohydrate. Research has shown a dramatic increase in Creatine Phosphate concentration when supplementing with 1.5g of Kre-Alkalyn® daily for 2 or more days. Kre-Alkalyn® also buffers lactic acid. Accumulation of metabolic acid (H+) is recognized as a rate-limiting factor in exercise. Kre-Alkalyn®'s patented buffer system immediately neutralizes the acid in the stomach, protecting the buffered Creatine from creatinine conversion. The acidity is reduced and Kre-Alkalyn® is ready for absorption. After entering the small intestine, bicarbonate ions are secreted to further alkalinize the Kre-Alkalyn® for absorption into the blood stream. Kre-Alkalyn®'s buffering effect assists in sparing the body's natural bicarbonate stores, prolonging muscular performance and delaying the onset of fatigue. What will pH-correct Creatine actually mean to you? No more nasty side effects. No more loading. No more cycling. No more sugar or dextrose transport systems. Best of all, a small serving is all that's needed to reach your muscle cells intact and with full impact and no bloating. Q)What is the suggested method to use Kre-Alkalyn®? A)The directions are to take 1-2 capsules once in the morning and once prior to exercise. It is recommended that most people do not exceed 4 capsules or 3 grams a day. Q)How soon can I expect to see results? A)Many athletes see results after the very first day, however the majority sees result within 3-5 days. Q)Can I stack Kre-Alkalyn® with other products? A)You may combine Kre-Alkalyn® with protein and with carbohydrates. If you also use our NO booster ArgiNOne, make sure to take your Kre-Alkalyn® serving about an hour or so before or after the ArgiNOne serving. The reason for this is that Arginine Alpha-Ketoglutarate is actually quite acidic.